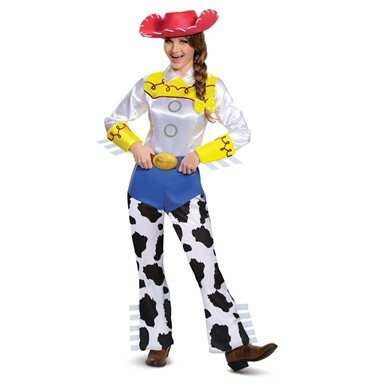 You will yodel when you put on this Jessie Deluxe Adult Toy Story Costume! You wont get the blues in this outfit so go on and yell yee-haw this Halloween! Small 4-6 33-35" 24-26" 35-37" 26-28" 5'3" to 5'8" 110-125 lbs. Medium 8-10 35-37" 27-29" 37-39" 27-29" 5'4" to 5'9" 130-145 lbs. Large 12-14 38-40" 30-32" 41-43" 27-29" 5'5" to 5'10" 145-165 lbs. XL 18-20 45-47" 37-39" 47-49" 26-28" 5'5" to 5'9" 175-190 lbs. Please note: Sizing varies from costume to costume. Our costume measurements are in inches and based on U.S. sizing. Please review the size chart on each costume before purchasing. Toys can be cute, smart, and sassy just like people can! If you don't believe me, check out the lovable cowgirl Jessie from Disney/Pixar's Toy Story 2! This adorable toy had a hard story but managed to find home with an owner who loved her! And now, you too have a chance to bring this cute Toy Story Jessie Costume home with you! Our Jessie Adult Deluxe Cowgirl costume comes with a blue and white jumpsuit, with an attached belt, cuffs, and cowskin chaps detail! This Toy Story Jessie Costume even comes with Jessie's red cowboy hat and yellow hair bow! Wrangle yourself up a mighty fine look by purchasing this Adult Deluxe Cowgirl today!